An Evening of the Past, In A Place of the Future? 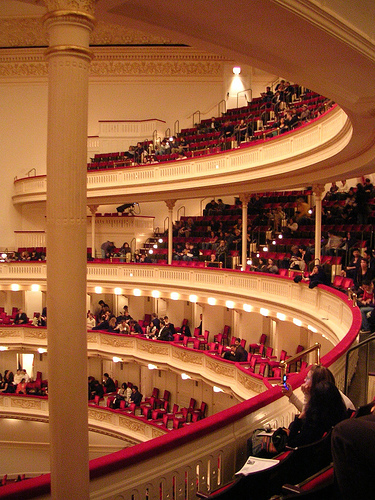 Thursday night I went to the Tibet Benefit Concert at Carnegie Hall, hosted by Philip Glass. It was a great musical experience, featuring Sufjan Stevens, Marisa Monte and Band of Horses and many, many others. The performances were incredible, with Sufjan Stevens’ reworking of “The Star-Spangled Banner” and Nawang Khechog, a Tibetan multi-instrumentalist, doing “The Last Stand of the Wild Yaks” with drums and a mini-didgeridoo. There was also Ashley MacIsaac and Phamie Gow playing a very catchy piece on fiddle and harp, respectively. To bring down the house, they had Ray Davies of Kinks’ fame play two classics, “Lola” and “All of the Day and All of the Night”. It was a great night for such a prestigious and historical venue like Carnegie Hall, except I was decidedly unfulfilled. The artists were still making the speakers pop when they plugged and unplugged their instruments, and numerous times the performers had to ask a tech to help them get sound out of their amps. All the technical difficulties got me thinking about how just because society might have fancy new phones and computers, the art of performance hasn’t really come as far as it should in the past twenty years.